Students and staff quickly filled the room as soon as the clock hit six last Wednesday evening. Richie Plass, a Native American activist, wants to change how Native Americans are portrayed in the media. He discussed many of his personal experiences as well as emphasized the purpose of honoring other cultures. In many ways, the meaning of honor gets tossed around in the media and isn't accurately demonstrated. Especially when it comes to mimicking the Native American culture, a lot of the inaccurate portrayal is because of money. For example, the Cleveland Indians baseball mascot is not an accurate depiction of Native Americans. In fact, the Cleveland Indian baseball team has no connection to Native American culture. Their mascot is Chief Wahoo. Plass explained that the mascot and branded image simply exists because it pulls money into the baseball franchise. It's not honoring or involved with Native American culture and the image is a stereotypical Native American face. 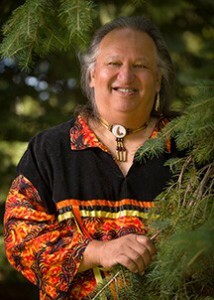 In 2003 Plass taught Native American studies at Kent State. He wrote several letters to the baseball team to ask them why they used the logo of Chief Wahoo. Plass even asked if the franchise could send a representative to his class to explain to the students how and why Chief Wahoo is used. Plass explained how himself, his children and his grandchildren should feel proud about it. Each time he wrote a letter he didn't receive a response back. By the third letter, Plass proposed that the Cleveland Indians should take everything that they sell that has Chief Wahoo on it and take one half of one percent of the sales to set aside for a scholarship fund for native students in Ohio to go to college. Suddenly, the Cleveland Indians wrote back. They said "No, we can't do that because it will cut into our tax flow." The history of the team has nothing do with Native American. Another sports team is the Chicago Blackhawks, which has nothing to do with Native Americans. The name comes from a bomber squad in World War II. Where is the pride and honor in this? Certainly not for the Native American culture. Plass went on to describe the history of Native American terminations in the United States. During the 1950s, the U.S. government enacted a law that would hand pick tribes across the country and terminate them. Plass's tribe was one of them. There was no support from the government and the tribe lost everything. By another act of congress in 1973 was the restoration act. Plass's tribe was on of the few tribes that received their full recognition back. So, when Plass was born in 1951 he was considered an Indian, after 1961 he wasn't considered an Indian anymore. Then after 1973 Plass was once again considered an Indian. "Talk about identity crisis," said Plass. Native Americans are not marketable, but their names and mascots are. Sports teams, mascots and the labels do not honor the culture. But, Plass states how Native Americans don't own these logos and team names because they're trademarked. This affects how the media portrays the culture because they never actually see the culture. They think the culture is experienced through labels, mascots and logos. Overall, Plass encourages everyday people to observe their surroundings. If they see the usage of Native American culture they need to ask themselves if this usage is necessary and why is it being used. Also, the media needs to be challenged. They need to get out from behind their desks and actually travel to a reservation and experience Native American culture for what it really is. It's not just a mascot on sportswear and it's not just the title of a sports team.